@andrew great work. For one designing many pcbs is it a good investment to have a CNC machine for prototyping? @sundberg84 well, I've my own PCB UV exposure toolset at home as well, so I can create PCBs both with CNC isolation routing or with photo transfer and etching. depending on the need I can choose the right toolset. CNC has some advantages, e.g. no chemicals are necessary; you can easily create (mill) any PCB outline, drilling or hole milling is quick and precise. I managed to create nice 6mil tracks with 6mil isolation without any issue. on the other hand the UV exposure version works very well, but due to my printing limitations I managed to go down until 8-10mil traces only. it is also harder to cut and drill the PCBs, or you have to manage to make the proper alignment and set correct reference points for the CNC. but, if you have to remove a lot of copper, then it could be much more efficient compared to CNC isolation routing. raw PCBs are basically cheap, and I also prefer to have the first results for cheap and without waiting weeks for PCB delivery. 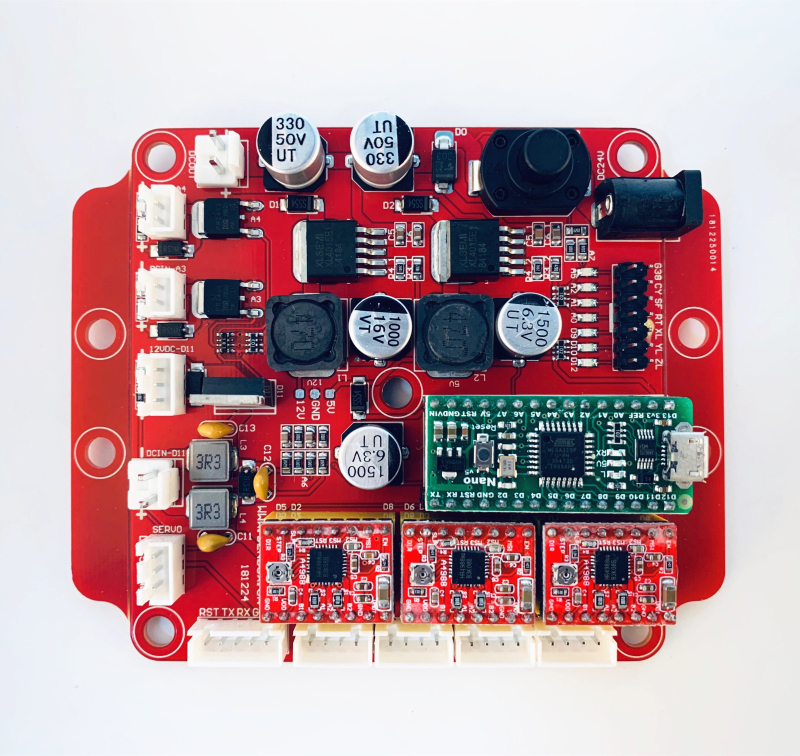 so, I create my prototypes at home, test them, and as soon as the given project is ready to "release" (and if it necessary), then I order the design from a professional PCB fab. as you see from the pictures above, I had to create couple of designs to properly adjust the mount holes and the PCB outline, I also enhanced the circuit itself, so it was definitely much more cheaper and faster to do all of this at home instead of ordering a set of PCBs for each revision. Also, are you happy with it, or now that you've used it or is there a different one you wish you had gotten instead? @neverdie just search for "cnc 2418" on ebay and you can find a lot. almost all of these are Chinese stuff, but works without any issue. 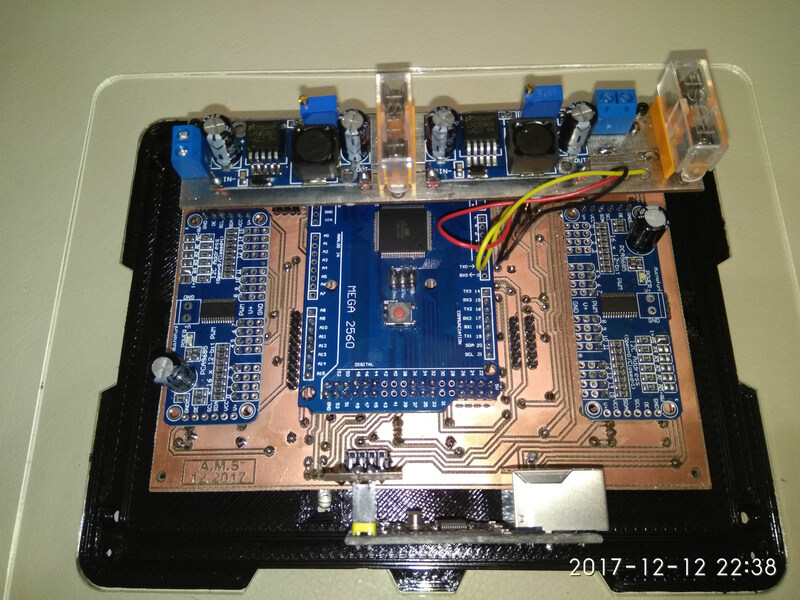 based on your needs you can find bigger or smaller versions, such as cnc 1610 or cnc 3020.
the chosen one should be USB connected and GRBL firmware controlled (check it in the description), so you can use it with open source tools, such as bCNC (https://github.com/vlachoudis/bCNC), chilipeppr (chilipeppr.com/grbl). for isolation milling you should use flatcam (http://flatcam.org/) for the G code preparation based on the gerber and drill files exported from KiCAD/eagle/etc. 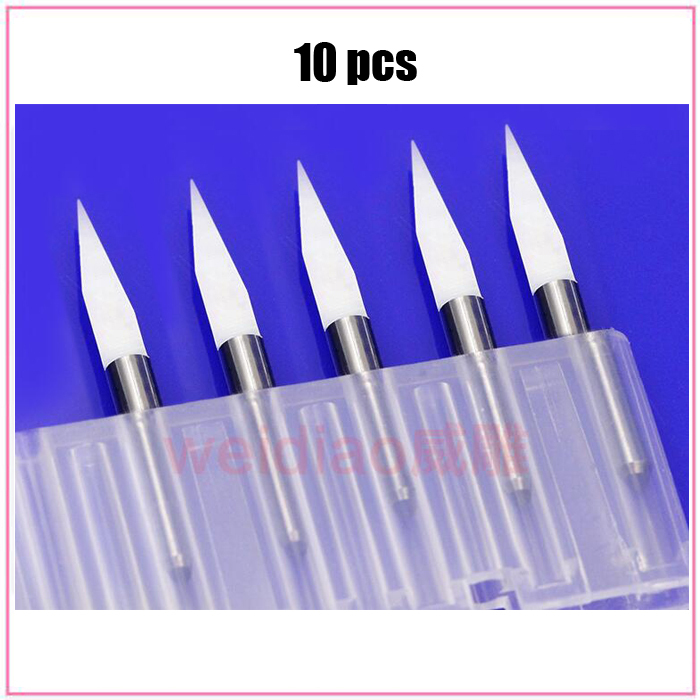 drill sets, milling bit sets and engraving bit sets could be ordered from China for couple of bucks only. Would you mind sharing your process for milling the pcbs? A friend bought a similar cnc and so far we've not found a process that's reliable and produces consistent results. Edit: nevermind, you just shared it in the post above Thanks! proper and precise building and calibration of the cnc is essential. the right values should be discovered for various parameters, then with a sw like flatcam you should create an isolation routing path G code, which will be sent to the CNC with a G code sender tool (e.g. bCNC). as PCBs are not flat, for fine traces the autoleveling process and the related G code adjustment is pretty important. the tools are supporting this, you just have to use it. @andrew thanks. Next time we try, I'll incorporate the info you posted and see if we get better results. We did notice that the leveling / height map was very important. It would be great if there was a super detailed how-to on this. My fear is that it would take me 100 hours to figure out how to make it work well enough or else I'd get stuck like mfalkvidd. But if someone has already figured that out and posted a "no brains required" demo of what to do exactly, then it's a whole different story. Of course, I don't know if anyone is motivated to do that, or whether some kind of quid pro quo could be arranged to make it worth their while. On the other hand, it's less than the cost of a good power drill, so I guess it's worth taking a flyer on it. @neverdie indeed, unfortunately it is not straight forward every time. it also took me a while to discover the possibilities and fine tune the results. although I'm not an expert, I'll try to create a howto on the topic. it is on my todo list, together with some write-up on my other electronics and hacking projects. @andrew I'm looking forward for any input or ideas from your side on how to setup something like this. Speaking of this, I read that you can black spray paint your copper clad PCB material and then laser ablate the copper you want to remove. I don't know what kind of wattage would be required to do that though. However, I imagine you could maybe get finer mil isolation widths doing it that way? I think there might even be some youtube videos on it. @neverdie it depends on your laser focus and spot size. to my "taste" that black spray solution is pretty rudimentary. you can use a small power laser (or stronger lasers with pwm control, which is basically a feature for a lot of cnc controller board as well) with photoresist pcb instead. you can buy single or double pcbs with photoresist layer pre-applied, but you can do it at home as well with spray or with dry film. @andrew Do you mean just removing the photoresist with the laser (not so interesting), or the underlying copper as well? Anyhow, I'm thinking it might avoid the leveling issue, since maybe the laser wouldn't be as sensitive to non-flatness? Or, is that where the "focus" comes into play, and so it still has to be considered? OK, so at Jack's store, I can get one, with FedEx delivery, for <$200. @neverdie just to make the necessary uv exposure to the photoresist layer, then you still have to develop and etch it (see: https://www.youtube.com/watch?v=4SNkzoOvoD8 ). with strong lasers you can eliminate the copper as well (see https://www.youtube.com/watch?v=dZYVda4fC4k), but those are not in the hobby category. @neverdie this is exactly the same as mine, even better, it has er11 bit mount on the spindle, which I just ordered for mine. I ordered mine from EU (it is still Chinese) to avoid the issues with the custom, but from China it is cheaper. @andrew Are you milling regular FR4? When last I looked into this, TheOtherMill recommended something a little different (don't remember what now, but I think it was some kind of coper cladded plastic substrate rather fiberglass). Not sure why. Maybe it's easier on the milling bits or something. @neverdie yes, I use standard FR4. if I remember correctly, I read some articles which sad that other PCB types could be more flatter (but the inaccurate flatness could be handled with the autoleveling) and those might not "eat" the carving bits that much. unfortunately I don't have experience with other types but FR4 PCBs. 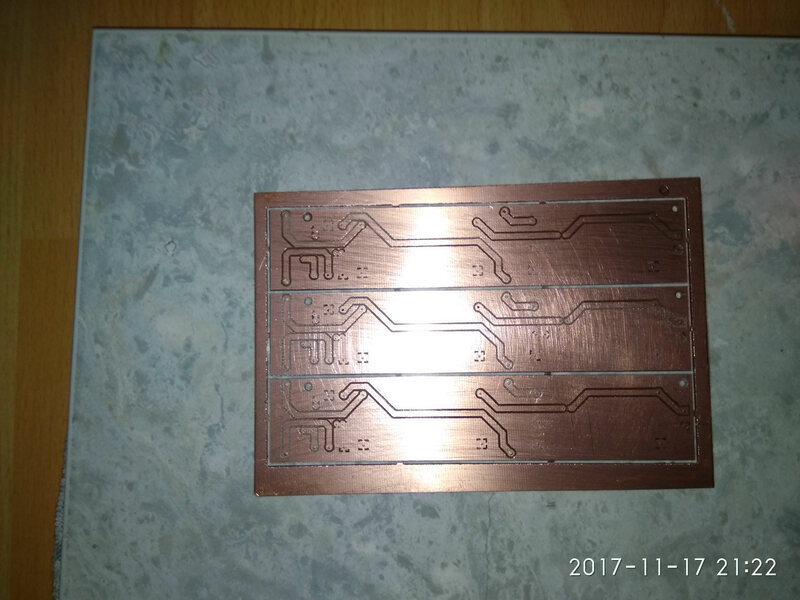 just to have some related pictures in this tread as well, here are some on isolation routing, pcb outline milling and on some test results. Well, I'm sold. I just ordered one. @andrew I hope you're still around after it arrives. you'll love the stuff, I bet for it. in the meantime I'll try to finish a howto on the cnc assembly/setup and on other tricks, such as firmware upgrade (which is not officially documented). I received the pack like the pics below, it took me two nights to assemble it. Which of the 6 "models" should I pick? for fine isolation routing I use 2001 bits (20 deg, 0.1 width), this gives you 0.1363970234mm	(5.369961552mil) width at 0.05mm cutting/carving depth. the more sharped bits are more precise but more fragile as well. 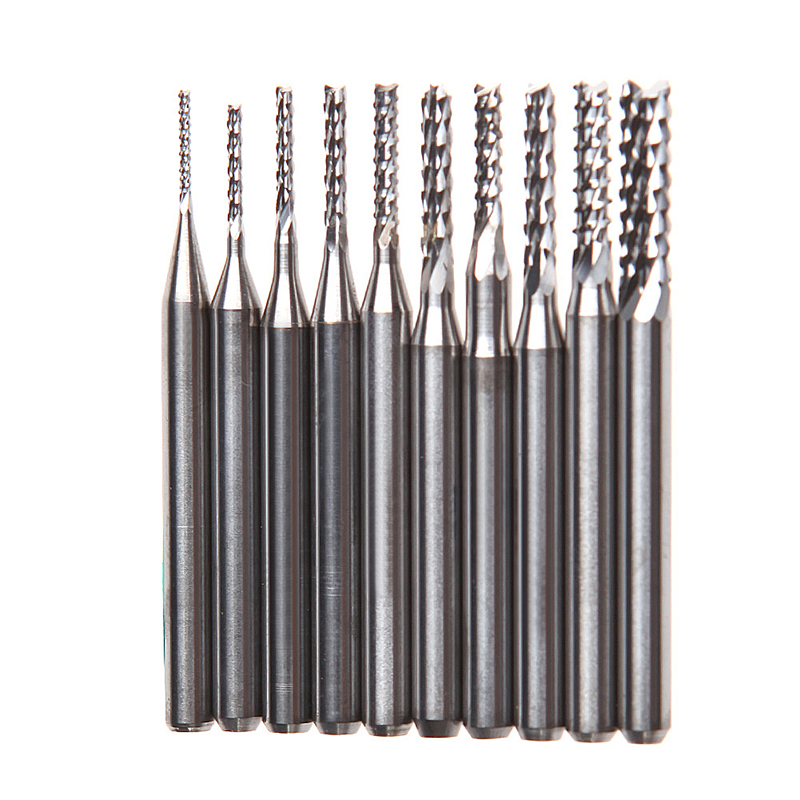 for hole milling, outline milling I typically use 0.8mm end mill. it is good to have multiple items from each different tools / sizes, so you can vary them, based on the needs, and replace them if necessary (broken or blunt tools). @andrew OK, so do you recommend getting one set of each model, or multiple sets of the two models you indicated? Or...? Looking at reviews on Amazon, it seems that some boards use a bad adhesive, resulting in pads lifting during soldering. I don't know whether these use a good or a bad adhesive. I'd prefer to buy boards that are "known good" rather than roll the dice. @andrew Anything else I should order while I'm at it? 0.8mm end mills for slot milling, edge cuts and to mill holes which are bigger than your drill bits (e.g. mounting holes). 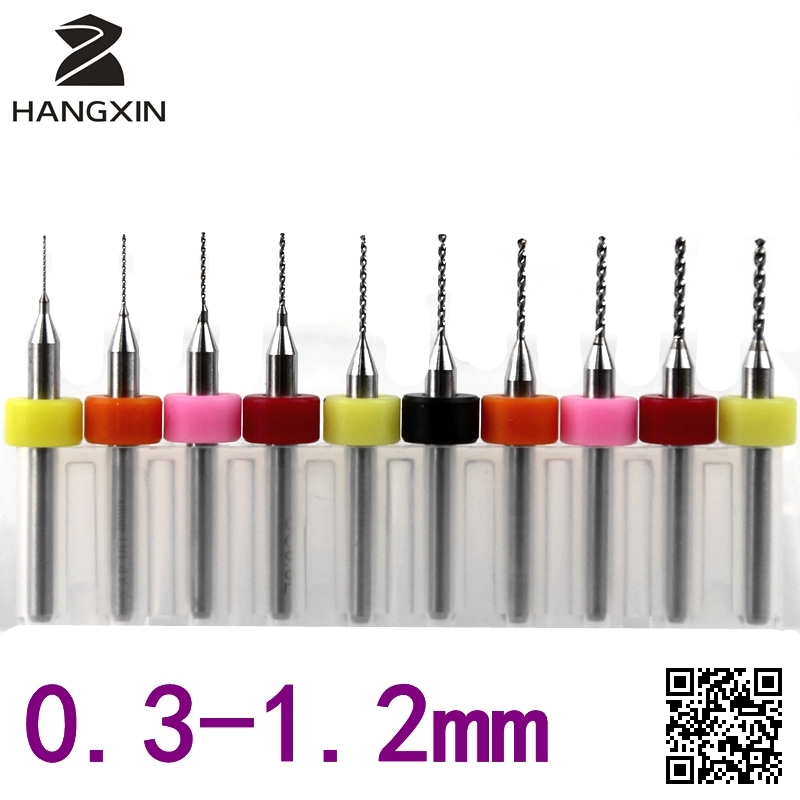 the previously mentioned set is good, as you have multiple options for different tasks, but I still recommend to have some spare one from the 0.8mm end mill in advance. same applies to the carving bit sets. buy one set with multiple size variants (in the given link it is "model 6"), and buy another which just contains 2001 bits (model 2) as these bits will be used the most. PCBs. I usually buy mine from local stores, but your linked one seems to be fine. nothing special, single side or double sided FR4 PCBs, based on your needs (size, thickness). I use 1.6mm thick 1oz FR4 boards, others should work as well. you will/might need double sided adhesive tape, and a sacrificial layer for the cnc, to protect your cnc's bed. I applied a wood board cut for proper bed size for this purpose (see before / after pics below). when you drill holes or mill edges/slots then the drilling/milling tools should go through on your PCB, so there should be a sacrificial layer between your cnc's aluminium bed and the PCB. this layer should be replaced when it become very used. I have been working on gathering parts to build either another 3D printer or CNC machine like this. I think I am sold on a CNC. A question I have on this is what kind of control board does this use? Is it just a standard RAMPS 1.4 board like ones used in 3D printers? Also, is that just a piece of MDF mounted for the build plate? Curious why you didn't just put some T-nuts with clamps on the V-slot plate? Is there an advantage to using the MDF? Curious why you didn't just put some T-nuts with clamps on the V-slot plate? Is there an advantage to using the MDF? Without the sacrificial MDF material (where, presumably, MDF is flatter than ordinary wood), then when you drill through the PCB material, wouldn't you also be drilling into the v-slot support metal? i.e. presumably you need some kind of sacrificial layer, and the flatter the better. A question I have on this is what kind of control board does this use? @dbemowsk that is just a simple laminated MDF, but other materials could also work. the only advantage it has is that it is not a very strong material (when the drill or milling bit go into that) and it is flat. I used T-nuts at the bottom, but I did not receive clamps, so this is why I drilled the MDF and fixed like this. my original screws were longer than necessary, so later I replaced them with a shorter version (see the picture below), so it is not disturbing now. you can use clamps, but if you would like to drill or mill as well and not just isolation routing on the top layer, then you need a sacrificial layer between the PCB and the cnc bed. this could be also fixed with the clamps, so it is basically up to you how to solve this. I went for this solution as it is flat, fix and very stable. for the double sided PCBs I can (and have to) use alignment holes with an additional tool in the holes to position the PCB, then a simple double sided adhesive tape makes the job to fix the PCB. this cnc comes with the controller board which is mentioned by @NeverDie, it is basically a GRBL compatible board. you can also use different controllers such as arduino based ones, Pi CNC Hat, TinyG and others. it uses Pololu drivers like the RAMPS, but for the RAMPS I'm not sure in the communication protocol. @neverdie Good point. I hadn't thought about that. A RAMPS board is much cheaper, but I don't know if that can be used for CNC. @andrew Thanks for all the links. I've ordered everything on your list. Which software will be the first I use? Maybe I can start learning a bit about it while I wait for the deliveries to arrive. i needed a bunch of boards for my home automation project and it took way to long. Changing bits for engraving/drilling etc and then the costs of the pcb itself. I went to https://www.itead.cc/open-pcb/pcb-prototyping.html , double sided smaller circuits then with your milling machine and coating , looks like factory pcbs. it is fun to see the machine working though, made some timelapse videos. I guess you have experience with EDA tools, such as KiCAD or Eagle. this should be the first point. you should export your PCB related gerber and excellon files (top and bottom copper layers, edge cuts) from the given EDA software, then flatcam is the next one. in flatcam you have to import the exported files and do all of the necessary preparation work, to create the necessary G codes for every tasks, including isolation routing, milling and drilling. this will be your main tool, so discover it as much as possible, including the double sided pcb handling part. most of the manual preparation happens here. maybe this tool is the most important in the whole process. after this, you just have to use a G code sender tool which will control the CNC based on the G code, but this is the easy part. you need a CNC for that, so let's get back to this once you have a working setup. maybe in the meantime you can check e.g. bCNC's and chilipeppr's general howtos. without a working cnc you can also visualise and simulate the G code, e.g. with CAMotics. @vince I think it's meant for prototyping, not production. At least for that purpose, the reduction in turnaround time should be huge. If, instead, you send everything to the fab at every step, then you need the patience of a saint to iteratively evolve a PCB design. @andrew you wrote you sourced your cnc from the EU. Could you share where you bought it? @yveaux I bought mine from "rattmotor" seller on ebay (https://www.ebay.com/usr/rattmmotor), but I basically just limited the item location filter to Europe when I searched for cnc2418 on ebay, then I made my choice based on the price and seller ratings. @yveaux Even Amazon.com sells them. Some even have 1-day Prime shipping, so you could have one tomorrow if you wanted. @yveaux search for "cnc 2418" with space separated, then you can find some one from Germany. @andrew ok, thanks! It was probably the mobile searching then that hid them. @yveaux If you do a fair amount of PCB prototyping, then it pays for itself pretty rapidly (as compared to using a Fab that is). Let's see how it turns out for you! @yveaux Oh, come on, jump in and share the risk! It will be more fun that way. @neverdie The attraction for making ready designed boards as one-offs is clear enough, the costs and time don't stack up for bulk manufacture, but that is not what these machines are intended for anyway. For those making occasional boards who have no time constraints such machines are an increasingly affordable solution without chemicals to mess with. @zboblamont I was just joking. Actually, I don't think there is much risk at all, because @andrew has proven it out already. If it weren't for him, and the results he's reporting, I wouldn't have had the confidence to buy a CNC 2418, or even embark upon this. I also think it's just one of those things where you either value the benefits, or you don't. That's going to vary a lot from person to person. That being said, the more the merrier! Also, though it's totally off topic, if there were a way to custom mill little project enclosures out of solid plastic, that would be a real bonus. That would obviate pretty much my only reason for also wanting a 3D printer. For instance, I can buy 1" thick vinyl planks at Home Depot for not much money, so it wouldn't matter if all of the plastic that's removed from a cavity is entirely wasted. It might even be cheaper than doing addative 3D printing from a spool. But, like I say, that would be gravy. I'm not banking on that. I suppose I could also make little wooden boxes from thinner sheets of wood that get cut on this CNC, and maybe that would be just as good. I'm pretty confident that could be done, though I'm not really sure as yet how. @neverdie I was referring to earlier comment from the more commercial viewpoint. It is a hobby machine, but with a variety of uses beyond the current subject, and at this cost level risk is minimal. I have woodwork and mechanical tools aplenty which have made short work of completely obtuse and dissociated tasks, this is simply another tool with a specific task in mind, but a variety of possible other uses. So I picked this thing up at our local university surplus store. It is a Lachat instruments XYZ auto sampler After some research, it appears to be a piece of lab equipment for sample testing. Not exactly sure how it works, but for the $20 US that I paid for it, I though it might be worth trying to build a CNC machine from it. The video clip shows the machine homing the X, Y and Z axis' when powered on. If you look at the image above you will see that the X axis rails and linear bearings are pretty beefy at 16mm diameter. It would be nice if I could figure out the serial interface to see if I could make it do anything. Just wondering what the thoughts are from the group. @dbemowsk the serial interface to those controllers which are used by most of these DIY CNCs are simple serial over USB, which speak grbl. if your motors are not steppers then I guess it would not be precise enough. @andrew I had made the assumption that it had to be somewhat precise being a lab instrument, but maybe i'm wrong. Wonder if I could convert to steppers. I'll have to check the motors and mounting. well, that is just my assumption. with steppers you definitely could turn exactly as much as you have to, with normal motors it is much harder as there should be some feedback based control (e.g. the rotary encoders which you mentioned). moreover steppers "keep" their status in one fixed position until they receive another polarity change (so a step), while in case of standard motors it is not true and if the mechanical part does not prevent it, then their axis could turn unexpectedly based on the external force it receive. @andrew When it homes itself to the left and stops, it appears to lock itself in position. Do you know of any software that I could use to test the serial connection if it in fact it does speak grbl? @dbemowsk any serial console could do the job. I usually use command line tools on OS X or linux, such as minicom or screen, but you can find graphical tools pretty easy. if you are working on windows then e.g. PuTTY could be a good solution. if it in fact it does speak grbl? It looks like older generation equipment. If you can find evidence that it was made before 2009, then there's no chance it speaks grbl. @andrew I am using linux. There are plenty of serial console softwares out there. I would just need to know some commands to send it. I'll see if I can google a grbl command list. @dbemowsk that is not a big deal. for first, if you get a promt like on the pic above, then it is a good indicator. then you can use "$" to get a text help. for the commands you should browse the grbl repo on github, which I already linked, it has a wiki as well. @andrew Thanks, I'll give that a try later today and report back. IF by chance it is grbl, is there a CNC software that I can use to do a mock run of something to test it further? @dbemowsk sure, e.g. bCNC on linux could the jon. @andrew Thanks, I'll check that out. @andrew - what would you say is the limitations of cnc drilling a PCB? I often use quite thin tracks (0,2mm) for everything except GND and VCC. @sundberg84 I often use 0.4mm drill bits for vias without any issue. 0.3mm should work as well. The drill set I linked before contains the most frequently used drill bits for PCB drilling (0.3 – 1.2mm). regarding to the traces, I have stable and reliable results with 6 mil (0.1524mm) traces / 6 mil clearance, which is also a limitation factor of several PCB manufacturer’s hobby/proto package. I'm kidding I don't think I really need one (I usually have multiple things to do while I wait for my pcb) . I would need a bigger, I'm tempted by a mpcnc someday, not for pcb. just curious, how do you handle small vias?? I imagine it can be some labor to make them connect both side? @scalz Well, in fact, at home I don’t make real but fake vias only, so basically I just use thin wires through the via’s hole and solder it on both side. I am sure it was used in one of the science labs at the university. When I saw it, they had $30 US marked on it for a price. I told one of the workers that I might be interested but wasn't sure. She said that she could mark the price down to $20 but that she had no idea what it was or what it did. I figured for that price I could at least get some useful parts off of it. Yes i know, like i said in the first line for 1 or 2 its nice but when you need more its not a great way to do it. or the pcb's are very small. According to FedEx package tracking, I may be receiving the CNC2418 as early as this Friday. Weighs 5 kilograms. Just posting this because some people here seem concerned about picking a seller who is not based in China. Maybe you don't need to. I think people concerns are about import fees (customs+vat) when using fedex, dhl.. if you don't get any fee, you're lucky! in France for example, they wouldn't miss me. Hmm... Not sure if there are any applicable import fees here in the US. Anyone know the rules? They recently opened one of my PCB packages "as a security check," but there were no fees I had to pay. EU has the VAT tax, which presumably they force upon you no matter where the seller is. I am in the US and I myself have never had any fees for things that I buy from china. One big one I got beginning of this year was my Anet A8 3D printer from Gearbest, and there were no customs fees or anything with that. @neverdie VAT is applied across the EU by the receiving country, by purchasing from another EU country VAT is already paid therefore no additional tax is due. It's the same, I never had problem when I get my order through regular shipping (and letters are in big bags, less easy for them i guess). hopefully! But when fedex, dhl etc are concerned, they always declare it to the customs (price order+shipping). They pay in advance the customs tax at airport, and then at home ask for the customs tax+little fee for the paper and because they advanced the money (approx 12€) + the VAT (20% of the total). Chinese fabhouse already told me a few times, for example, that they have to declare the price when they ship it and if I wanted to cheat it, that would be at my own risk, due to law reinforcements. Is there some minimum dollar (or Euro) threshold before the VAT or other fees kick in? If so, then on a CNC2418, it's easily avoided: just divide and conquer. i.e. just buy it as separate parts that get shipped separately instead of all at once in a giant kit. @neverdie 10 EUR here, 20 GBP in the UK from memory. Postal service rarely refer small packages to customs, large packages almost without fail, although I did get called in by them over a small DAC before. The problem here is the bureaucracy, form filling and general heel-dragging. DHL etc are more trouble than they are worth unless high value items, they declare everything as @scalz noted.. I can't imagine a chinese supplier being happy to send a pre-packaged machine in bits at no additional cost, and the risk of a part going missing grows exponentially. The cost difference from EU and China suppliers is sometimes not that great if you look around, it avoids hassle if EU source is acceptable price. @neverdie For Austria the threshold for import tax (=VAT substitute, 20%) is 22 Euros (value of the goods, excluding shipping and insurance costs) and for additional customs duties it's 150 Euros. I've used my CNC for milling PCBs for more than a year now. 1st: don't skimp on the machine itself, the 3020 and 3040 are ages ahead of 2018 in terms of quality and reliability (the numbers show the machine size in cm) as the the 3020 and 3040 have no moving bed, but a moving gantry instead, search for the ballscrew ones (normally Z-DQ but also some T-DQ, initially T meant Trapezoidal screws and Z ballscrewZ, but now a lot of T-DQ come with ballscrews). Get the parallel port ones, the usb ones are flaky, you can run an old parallel port (centronix) computer with old WinXP or LinuxCNC or attach an arduino nano/uno (328p) and run GRBL, just attach that to the parallel cable and you're set. 2nd: if you buy it stock it comes with a 300-400W aircooled 12,000rpm ER11 spindle, good but not good enough, I've upgraded for a watercooled 300W 60,000rpm spindle (costs almost as much as the machine itself) but I can run it at 1400mm/min and being watercooled it doesn't spread the "deadly" fiberglass dust everywhere. LE. you can also buy just the frame and buy separately the spindle, 3 nema 23 steppers, 3 tb6560 or 6600 drivers and a 24v or 36v PSU, we are tinkerers after all, aren't we? 3rd: it is said that milling fiberglass boards (FR4) can create very very very small dust ("charf") under 3 microns which when inhaled is never released from the lungs, gets it's way to the pleural membrane where it creates small cysts that can degenerate in lung cancer, a very slow an painful death. So a good vacuum cleaner which exhausts OUTSIDE is a must, unless you buy very high end and expensive professional HEPA filters. I use a Philips HEPA vacuum cleaner, being a hepa means all exhaust is from the back port and no additional airflow is created (my shopvac has dual airflow, one for debris and one to cool the motor, guess what they are not at all isolated between them) and after the exhaust filter I 3d printed a 50mm hose adapter and exhaust it outside. I've wrapped the contraption in a thick garbage bag and sealed it with tape so no air can escape inside. Another way of doing it would be wet milling using a lubricant as WD40, oil or even liquid soap but might interfere with number 4 below (swell the mdf sacrificial layer). -vacuum table: I've just bought a vacuum pump but haven't got the time to play with it yet. LE. before you ask, the boards are HA light switches, 6 way, rotary encoded, led ring lights, led halo around them (as in car switches), MQTT enabled, w5500 eth connected, 100% designed and home made, 3d printed frame and buttons, laser cut acrylic and faceplates, cnc milled pcbs. What sold me on the CNC2418, aside from its low price, was @andrew stating that he can mill isolation at 6 mil, which is no worse than what I could get from using a fab like OSH-PARK. What mill isolation are you able to get down to reliably using your gantry based CNC machine with ball screws and everything else you mentioned? About 0.2mm (8 mil I believe). Never needed to get smaller than that. Smallest chips I use are rfm69 or atsha 8 pin. The problem is not on a 20x30mm board but on a much larger one where having x and y axis not square makes a difference, where you need faster speeds since traces are much longer, etc. How much do you apply? i.e. Do you cover the entire back of the PCB, or use just a few strips of it, or....? @neverdie a few strips, 20mm width each, 30-40mm apart. in Hungary the VAT is pretty high (27%) which we have to pay on top of the customs fee. moreover, our customs and post response and processing time is very bad. the process could be speeded up if the shipping happens with e.g. dhl and they are allowed to do the customs, but then it also costs extra. so for me it was better to buy the cnc from EU, even if it was more expensive compared to the direct Chinese sellers, because at the end of the day, the overall cost was about the same (assuming that I would had to pay the customs and the VAT) but I received the package much more faster. @executivul thank you for the tips and for the shared experience. I agree, that the mentioned CNCs, have more robust structure, more powerful spindle, but I guess that the mentioned extra upgrade on the spindle is a bit overkill, especially just to create ad hoc proto PCBs at home. just be clear, I know that higher rpm and more powerful spindle could produce better and faster result, ballscrews provide smother and more precise movement, I don't questioning that, but for the price/value/reason of the usage combo I think the cheap smaller versions also do their job quite acceptably. 2418 is not the fastest, not the strongest, but precise enough for this purpose and it is pretty cheap. @executivul regarding to the parallel port question, these days, for these tasks it is worth to have compatibility with the latest open source toolsets, so usb and grbl compatibility is a key point. if you do professional cnc work, then you might need something different. I have never used it for pcb but @andrew tikkled my curiosity... very narrow tracks! It is well supported by the standard board supplied and GRBL takes care of it. It all runs on an old windows XP laptop. AutoCad for drawings, Dxf2GCode for... dxf to Gcode conversion and GCodeSender for feeding GCode to CNC. Are the end stops needed, and if not, how does the 2418 zero itself between tool changes? Or, I'm guessing, are end stops already part of the standard kit? Then inform GRBL about Homing settings like homing direction, speed and so on. @neverdie most of these entry level CNCs do not have limit switches. the controller board and the grbl firmware is able to to handle them, so you can install them anytime. when you power up the CNC, then it will have a "zero" point at the given x/y/z position. then, you can move every axis to the right position and set relative zero (usually at the bottom corner of your PCB) through the controller GUI. every movement declared in the G code will be calculated and will happen from this point. at the end of the given job (e.g. one round of drilling, or one round of isolation routing) the spindle will move back to the relative zero point, and will give back the control to you. here I elevate the spindle on the z axis and change the tool, then I zeroing out the z axis again with the new tool, load the next G code job and run it again. if you have limit switches then you can declare a tool change position which will be used every time and the cnc can do homing to real physical zero point as well. it is nice to have features, but you can do and handle everything without these. @andrew Just be careful with 6040, not to mention the 6090, they mostly use the same round rods as guides and at that sizes you tend to get a lot of "droop" (sagging), more than 1 mm across the long axis, which is ok if you're using them to carve wood or whatever but is very bad for pcb engraving. About the endstops, I don't have them and never felt the need for them, a cheap switch has a huge 0.1mm of error which can lead to holes milled between pads, cut traces, etc. What I do is place a hole in the sacrificial layer or the pcb near the edge, later if I need to reset the machine move the gantry manually so that the bit can enter the hole (spindle stopped of course), raise the bit and set zero. LE. Don't ask me about stupid taxes in a 3rd world country (Romania), in a small city where the nearest p-channel mosfet is 120miles away Here dhl morons ask $22 only for passing papers to the customs, plus 19% VAT for the whole amount, including the shipping(why since it's already arrived in my country? ), plus additional taxes if they can find one to match the content, so I prefer to buy from ebay.co.uk from within EU, even though the shipping is insanely expensive compared to direct Chinese free shipping, that's how I got the CO2 laser, the CNC, the spindle and vacuum pump for it and a few other heavy items. For small items I have no problem to get them through normal post no matter what the cost is. @ben999 for pcb milling the z touch probe is not so useful. you should do autoleveling instead, on the whole target pcb surface. 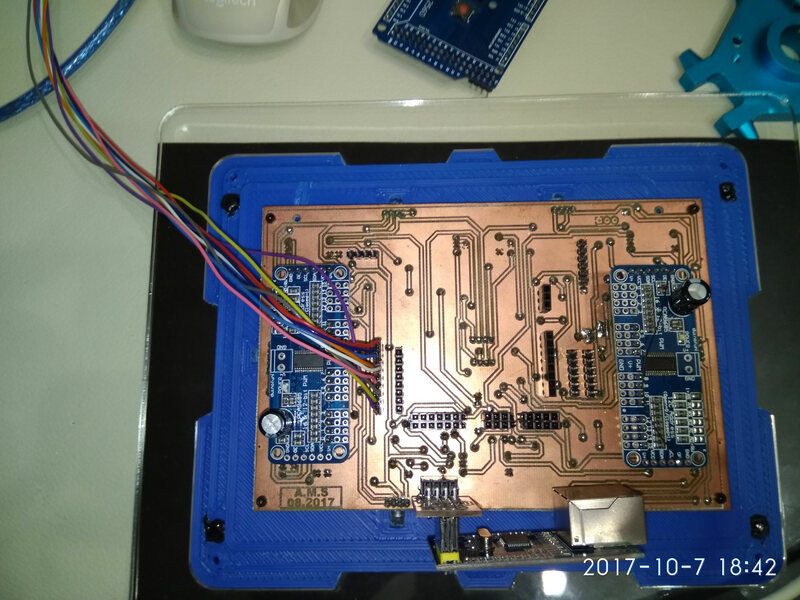 for this the pcb surface and the tool itself should be connected to the cnc controller board dedicated pins (usually the tool is connected with a crocodile clips) during the mapping. So, if I understand correctly, flatcam will import the gerber files and export a g-code file. Then, bCNC will spoonfeed the g-code to the CNC2418 control board. i.e. whatever hardware the bCNC is running on is physically connected by wire to the CNC2418. Right? If so, what kind of computer hardware do you recommend running the bCNC on? A Raspberry Pi Zero W, or something with more oomph? Also, do you recommend having a monitor display next to it, or is running headless just as good?